During one of the latest television debates the Minister of Foreign Affairs Audronius Ažubalis pointed out that national minorities do not have to be foreign policy’s hostages. He explained that accusations of violating the rights of Polish minority in Lithuania do not need to be heeded, as, in his opinion, they are unfounded. He quotes this year’s Freedom House report, which states clearly that rights of Polish minority in Lithuania are protected. On 31 July 2012 the court of Kėdainiai district (Kėdainių rajono apylinkės teismas) issued an injunction for a resident of the district, A. Š, for public incitement to hatred by a derogatory comment that involved encouragement for discriminating people for their nationality. The European Foundation of Human Rights is against discrimination! The European Foundation of Human Rights notices that increasingly more often there are job advertisements on the internet that have a discriminating character. As an organisation serving the community, the Foundation with its work contributes to bringing obeying human rights into our everyday lives and is concerned by such advertisements as those mentioned above. Therefore, we would like to give a few pieces of advice on what to do in order to avoid such mistakes when writing job vacancy advertisements. We would like to remind that discrimination is prohibited by both the Lithuanian and international law and regulations. European Foundation of Human Rights is pleased to announce that on 12 August 2012 at the Odyssey of the Polish Army Festival in Medininkai was giving free legal advices. The Festival was organized by the Vilnius Branch of the ZPL and the Polish Club of Theatre Arts. Stand of the Foundation draw a lot of interest. Everyone interested could read our leaflets (http://www.efhr.eu/ulotki/) and other brochures of the Council of Europe and European Union on human rights. The European Foundation for Human Rights held a charity event for the villagers titled “Kids for Kids” (further info: http://www.efhr.eu/2012/06/27/aid-for-children-placed-childrens-homes/?lang=en) in collaboration with the Centre for Polish Culture and Education ‘Plus’ in Brussels, the Polish School Joachim Lelewel at the Polish Embassy in Brussels and the Middle East Institute Foundation in Warsaw, with help of many other people of good will from Brussels. EFHR has achieved another success with respect to comments on the web! The European Foundation of Human Rights has been informed that on the basis of petitions filed by the Foundation another penal order to the author of offensive comment has been issued to the Regional Prosecutor’s Office (to learn about the previous successes, go to: http://www.efhr.eu/2012/03/15/first-penalty-for-comments/?lang=en, http://www.efhr.eu/2012/04/16/another-punishment-for-the-comments/?lang=en, http://www.efhr.eu/2012/07/18/3-wins-concerning-comments/?lang=en ). On the 10th of July, the Central Electoral Commission of the Republic of Lithuania adopted a new electoral district boundaries. The commission’s decision changed the boundaries of several constituencies in Vilnius, Kaunas, Kelme and Vilnius region. Two of them, dominated by Poles (Suzonys and Skirlenai), were incorporated into the „Lithuanian“ Svenchioniu-Moletu constituency. The commission justified its decision claiming that demographic indicators have changed – in some constituencies the population has greatly increased, in others – decreased. European Foundation of Human Rights continues the campaign against the increasing wave of hatred on the internet in Lithuania. Foundation wishes to express concern about the indifference of the state authorities to the lawlessness and incitement to hatred directed against a group of persons or a member of such a group on the basis of race, national or ethnic origin, religion or belief. Fraternité2020 is the first registered European Citizens’ Initiative (ECI) which aims at expanding EU exchange programmes – such as Erasmus or European Voluntary Service (EVS). Making these exchange programmes more attractive will enable more and more European citizens spend time in another European member state and fully appreciate the meaning of united Europe. Moreover, this experience will develop intercultural skills and facilitate positive economic, social and cultural development in the whole European continent. Lithuanian Court of Appeals agreed with arguments of lawyer Tadeusz Gudzińśki representing Wilnoteka on behalf of the European Foundation of Human Rights and upheld the verdict announced on 22nd December 2011 by the Vilnius County Administrative Court (for more information see http://www.efhr.eu/2011/12/23/the-court-rescinded-the-inspector‘s-penalty-for-wilnoteka-pl/?lang=en). Giving the ruling, the Court overruled the decision of the Inspector of Journalists’ Ethics who had imposed a penalty on the web portal for publishing the article “In defence of Polish schools in Lithuania.” The Court announced that while making the decision the Inspector violated the main principles of the procedure which were to ensure objective appraisal of circumstances and legitimacy of the decision. Now in its summer edition, the „Radio-eaters’ school” competition launches for the third time. 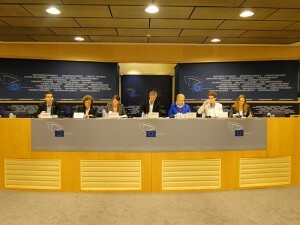 The European Foundation of Human Rights has received further notifications that three penal orders had been issued against the authors of offensive comments, on the basis of the motions filed with the Prosecutor General’s Office by the Foundation (about the previous wins: http://www.efhr.eu/2012/03/15/first-penalty-for-comments/?lang=en, http://www.efhr.eu/2012/04/16/another-punishment-for-the-comments/?lang=en). On23 April 2012 the District Courtof Panevėžys City (Panevėžio miesto apylinkės teismas) issued a penal order against the city’s inhabitant, V.M., for public incitement to hatred and national discrimination through humiliating comments. On behalf of the Council of Europe, the European Foundation of Human Rights has produced the Polish edition of the education pack “Rights and freedoms in practice”, which offers an accessible and comprehensive introduction to the European Convention on Human Rights and the workings of the European Court of Human Rights.